Food processing facilities require a lot of work to set up and run properly. Each aspect of the facility plays a critical role in maintaining a well-functioning facility. Sanitary food processing floors are one important factor you should always keep in mind. This includes not just the kind of flooring, but the setup of the floors as well, which can have a drastic effect on the facility. Beyond that, keeping floors appropriately cleaned and having the right drainage system in place will help to ensure you have a functional, sanitary food facility. The set-up of a food processing facility is essential. Without the right set up, a facility can suffer from a multitude of inefficiencies that will slow down production. Because of this, when you initially set up your facility, you want the layout to make sense and flows well. Each part of the processing facility should have a designated purpose and follow in order of the actual processing steps. From sorting the ingredients to preparing and processing them, to finally packaging them for wholesale. Each step should go in order, that way it is not only more natural for the workers, but it also minimizes the risk of contamination by keeping raw product away from the cooked product. While choosing the right floor set up for a food processing facility is incredibly important, it is not the only important thing to do. You also want to select the right flooring, one that will allow for proper food processing floor sanitation. Maintaining a clean and sanitary floor is an essential part of any type of food and beverage facility. Due to the products coming in and out of these facilities, there is always a chance of something going wrong, especially if floors are not kept clean. This is because uncleaned floors can harbor many harmful foodborne pathogens like salmonella, listeria, and e.coli. These bacterias can stick to the floor, and get kicked around by workers and equipment, allowing them to float in the air and eventually contaminate any food product in the facility. 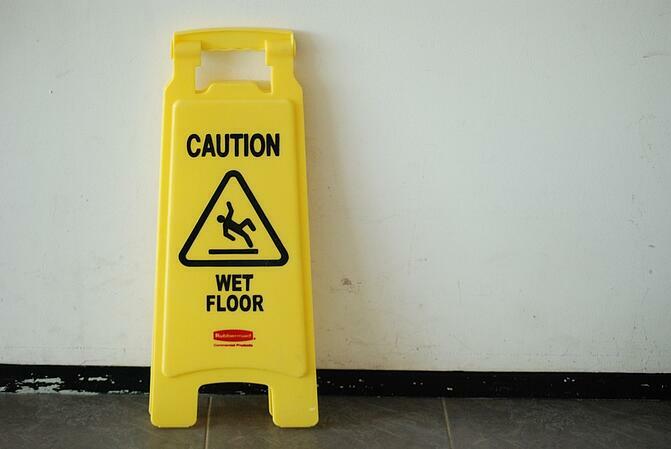 Having the right floor coating, such as an epoxy, is the first step in ensuring the safety of your facility. But, beyond that, you want to have a thorough cleaning plan in place. This includes sweeping floors of loose debris before applying cleaning and sanitizing solutions. 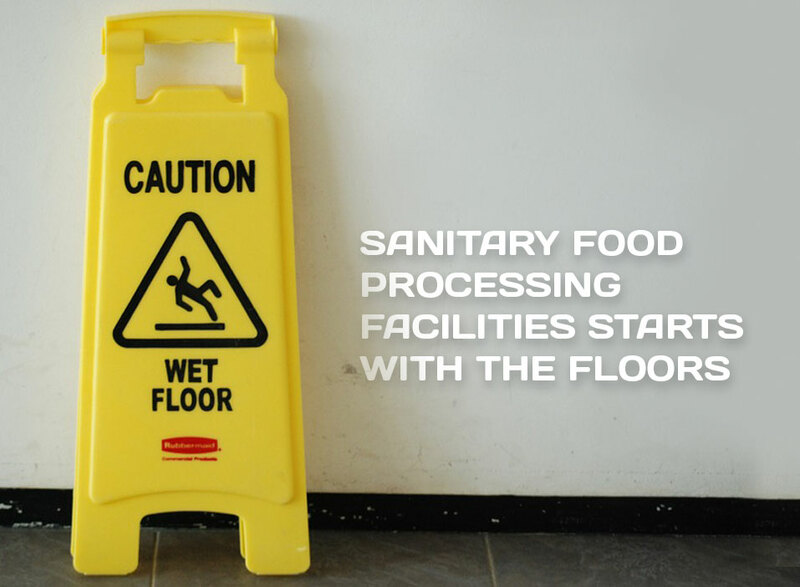 Following these steps will help to ensure that you have sanitary food processing floors. With the right floor and food processing floor sanitation plan, you also need to choose the right drainage system. Without proper drainage, wastewater will have nowhere to go, which can create the perfect breeding ground for various harmful bacterias. If you choose the wrong kind of drainage system or do not care for it properly, however, the same issues can occur. Drains should, like the rest of the facility, be on a regular cleaning schedule to avoid the build-up of waste that can lead to the formation of bacteria. This means removing all removable parts of the drain, like the grate, strainer, and quat block to clean the drain channel of any waste thoroughly. When considering floor drainage system options, you should consider what it is your food facility does, and what would work best for it. You also want to consider the amount of cleaning the systems require, which can vary depending on the material, length, and additional parts, such as grates. While there are many floor drainage systems available, you want one that is not only highly efficient but also easy to maintain. The system should work to help a cleaner and safer facility environment, and improve on the food processing floor sanitation as well. 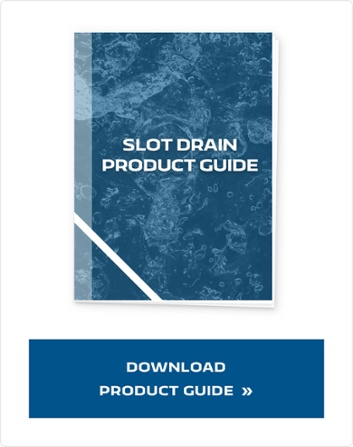 A great option to consider is the Slot Drain System. This is a newer and more innovative form of trench drain designed with durable, food-grade stainless steel. This stainless steel helps to make the Slot Drain System resistant to things such as corrosion, bacteria, and even extreme temperatures, making it an ideal option for food facilities. Its pre-sloped design allows it to easily replace older trench drain systems without having to tear up the whole facility’s existing flooring. But, the best part of the Slot Drain System is that it does not have a grate, making it much easier to clean and maintain—so easy, that it takes half the time of other drain systems. Sanitary food processing floors is an essential factor that you should never overlook when it comes to your food processing facility. Having the right set up will help to make work and cleaning easier and more efficient, as will having the right floor drainage system and cleaning plan in place. When combined, these three things will ensure the success of your food facility and help keep it a clean and sanitary place.